PNND members from around the world are in Paris for the World Climate Conference (COP 21). Many of them will be participating in the Inter Parliamentary Union Parliamentary meeting on the occasion of the UN Climate Change Conference (Dec 5-6). Agreement on radical reductions in carbon emissions, and timetables to phase out fossil fuel use, will be required in Paris. Action by parliamentarians is vital in order to push governments to agree to this, and to ensure national implementation. 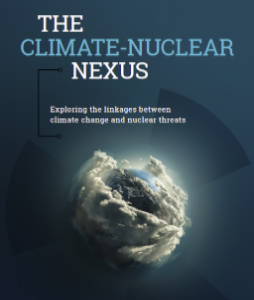 The Climate Nuclear Nexus, a report recently released by the World Future Council, highlights the links between nuclear disarmament and climate protection. Both pose existential threats to humanity and the environment. Both cause damage to future generations from irresponsible actions today. Both threats come primarily from actions from rich developed countries, but have a greater impact on developing countries. Both are already forcing people from their homes. Most importantly nuclear disarmament could help finance renewables and build cooperation required to protect the planet. If nuclear armed States stopped maintaining and modernizing their nuclear weapons, and agreed to disarm under international agreement, it would liberate billions of dollars that could be invested in renewable energies and other climate protection measures. (See COP 21 and the Climate-Nuclear Nexus). The International Renewable Energy Agency (IRENA) argues in a new report Rethinking Energy: Renewable Energy and Climate Change, that renewable energy sources would be able to replace fossil fuels and provide additional energy to meet development needs if there was sufficient political will, policy shifts and financial investment. IRENA and the World Future Council believe that nuclear energy is not required to fill the energy gaps in phasing out fossil fuels and providing additional energy especially for developing countries. 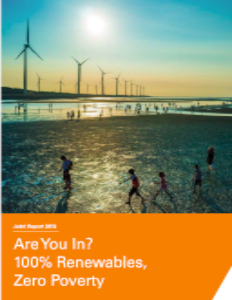 See 100% renewable energy, zero poverty, are you in?